A non-profit helps gang members go legit. PANAMA CITY – Samuel Palacio is dripping wet, and not only because of Panama City’s oppressive midmorning heat. Today is the day he launches his new business, a pedal-powered mobile minimart called Delivery del Casco, and there is a lot at stake. “I’m excited,” he says, standing on a dusty side street in the Casco Viejo neighborhood. “Nervous and excited.” Nearby, a dog flops down in the shade of a palm tree. 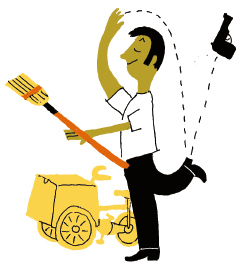 Palacio sets off to deliver a broom, a simple job that he hopes will turn his life around. Until recently, Palacio, 23, was a gang member, part of a brutal subculture that has traumatized this city. He has four bullet-size scars to show for his troubles, and he is no stranger to Panama’s prison system. But, a few months back, he got lucky. With this, he eases his cart into a torrent of taxicabs, beaming like a man who has just won the lottery.